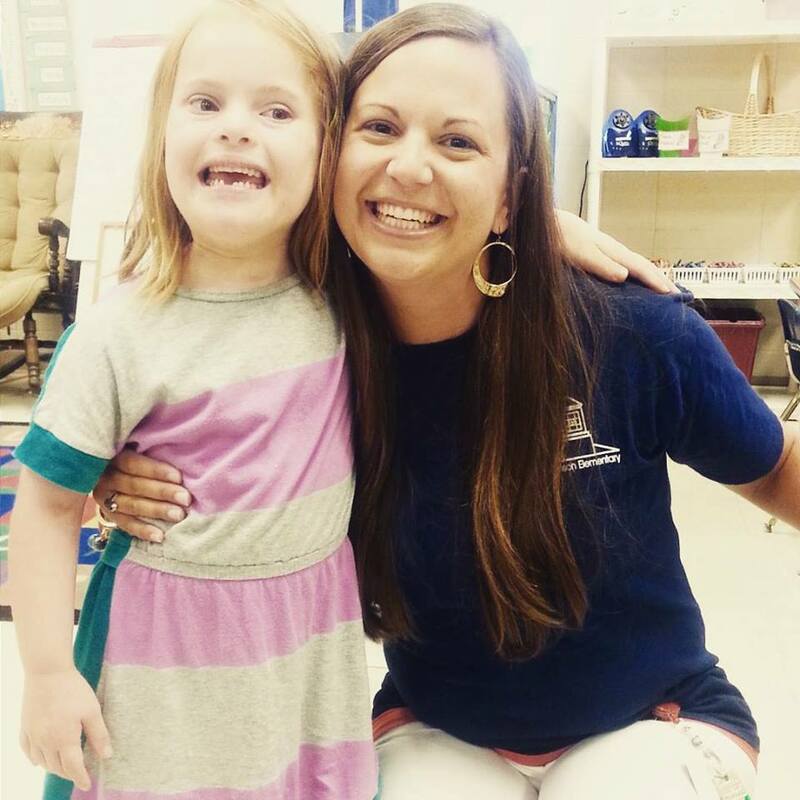 The Quail’s new first grade teacher’s sincerity brought tears to my own eyes. All summer I had been wondering if this next school year could possibly live up to last school two or if they were just flukes. We’d had our share of pushback in getting a spot for the Quail in a typical classroom. 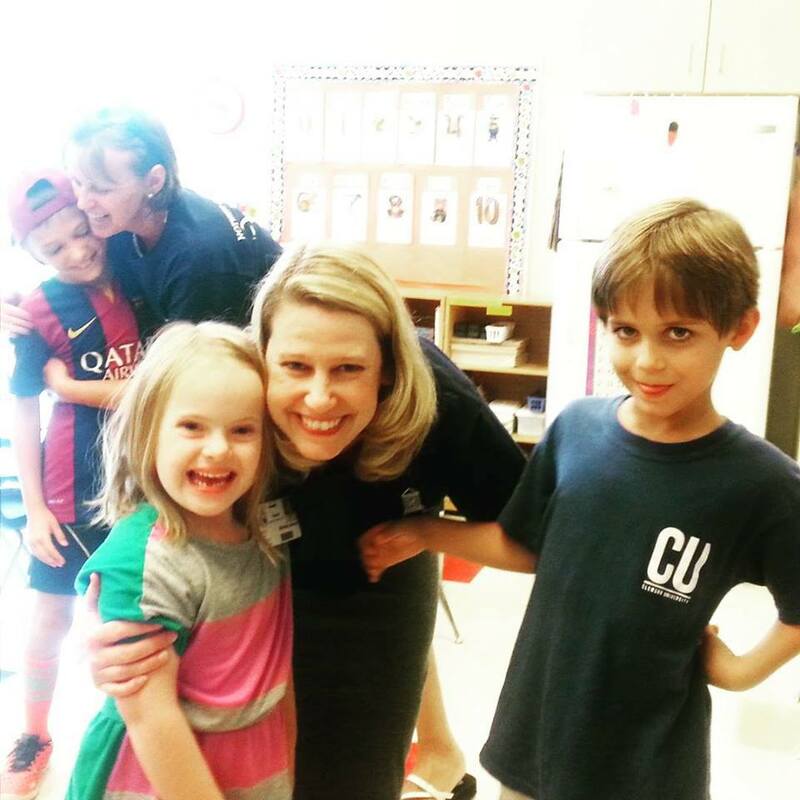 But once she entered that classroom on the first day of her 4k year her educational team was all in. She’s made friends, gone on field trips, attended birthday parties and playdates. She’s become a Daisy Scout, a dancer, a soccer player and a football fan. She’s learned to read, to write and works hard on her math. She leaves my car in the morning, grabs her backpack, hollering a cheerful, “Bye Mommie! Uv oooo!” as she scans the sidewalk for familiar faces and marches off following her sister. Some days she’s good. Her star chart blooms shades of blue and purple stars. Most days she’s average and tells me about her green star she earned and what she ate for lunch and which activity she went to. Occasionally, she’s naughty. She won’t listen. She’s stubborn. She kisses a boy. 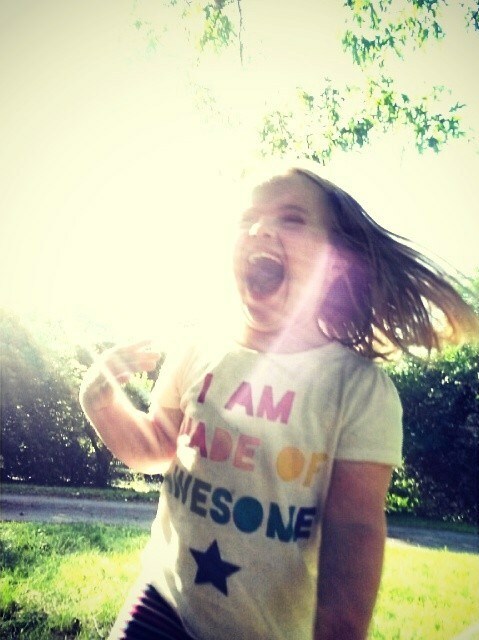 But mostly she’s just a kid. She’s shown her community that she really is that…a kid. With good days and bad. With strengths and weaknesses. With talents and enthusiasms and fears and love. By just being herself and showing up. She’s created an awareness that wasn’t there before. She’s made something that was different and scary and historically unfathonable- having a non-typical kid in a typical classroom ok.
Last fall her kindergarten teacher emailed me to ask how we would feel about the school doing an awareness campaign and fundraiser about Down syndrome during the month of October. I was both for and against it. It’s one thing for us to raise awareness indirectly in cyberspace. To not confront people and make them listen, but rather to do our thing day to day with open arms and hearts and minds creating a space for others that are curious to feel comfortable asking a question. It’s another thing, to take a small child and make her the center of a campaign that points out her differences to those around her everyday. I’m not naive. I know 99% of the people that look at her think, “Down syndrome” when they see her already. But children are different. Children don’t naturally categorize different as other and something to avoid at this age. That comes later when they see how society tells them to act. And I admit I was more than a bit fearful that this campaign could single her out and make her self-conscious. As the month progressed we were kept up to date on the funds raised and the facts of Down syndrome shared. The Quail’s class challenged the other classes to bring in “Dollars for Down syndrome” which were given to our local advocacy organization. 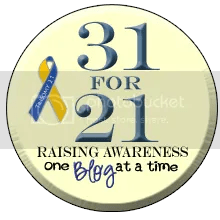 Zuzu’s teacher told me something that was an unintended side effect, this awareness campaign lent a voice to Zuzu. As her classmates brought in their dollars they often brought them directly to her letting her know they cared. Zuzu in turn would check in with her teacher to see if there were any new donations and then throughout the day, unbidden, go up to each child who had brought a dollar and thank them and tell them a little bit about Down syndrome in her own words with her own understanding- about how Down syndrome is different for everyone that has it and how you know that some kids wear glasses to help them see, well her sister does exercises called bite-bites to help her talk easier. I heard about this in November. After it had occurred, and was such a matter of course for Zuzu that she didn’t even think to bring it up. For her it was just natural. 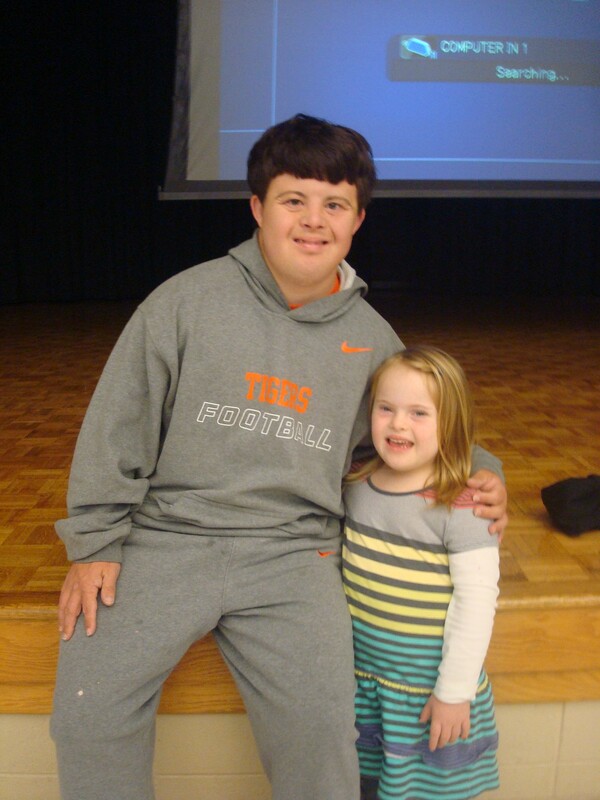 Our family was invited at the end of the month to an assembly where the total raised was announced and a special guest speaker from the ClemsonLIFE program, a young man with Down syndrome, came to speak to the school about the importance of never giving up and always believing in yourself, because if you tell yourself you can do something you eventually can. For him this was attending a college. At the end of his slide show everyone cheered, Zuzu, who had asked to sit with us rather than her class, ran back to her friends, the Quail clapped, hugged us and ran off with her classmates and we offered up our thanks to this small community that had made a space in it for our girl. And had helped the others who spend their days with her understand that even though she may speak and learn differently then them, she really is just another kid. “You’re going to make me cry. I don’t think there is anything kinder that a teacher could tell a worried parent then that they are happy to have your child in their classroom. Thank you.” Wiping the tear back, I leaned down to the Quail and asked her if she remembered Mrs. S from last year. Nodding shyly, she scooted out from behind me and walked over to Mrs. S and gave her a hug. It looked like things just might be ok again. *Technically today’s prompt from The IDSC was “Down syndrome Awareness shirt”. This right here is one that the Quail went to school in quite a few times when we first got it. I think just her wearing it and living her life, shows what we think. This entry was posted in 31 for 21, School Daze, The Quail. Bookmark the permalink.